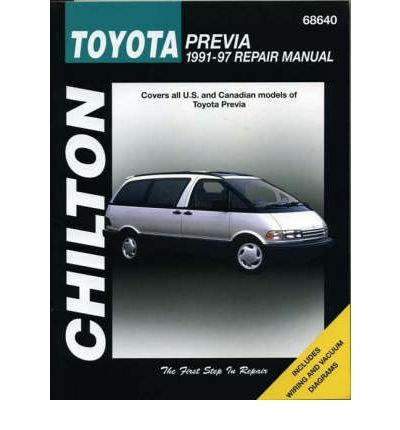 Toyota Previa (Tarago) 1991 - 1997 Chilton Owners Service & Repair Manual covers All US and Canadian models of Toyota Previa (also known as the Tarago in Australia). This manual also covers AWD vehicles. The Toyota Previa, also referred to as the Toyota Estima (Japanese: Esutima) in Japan, and Toyota Tarago in Australian Continent, is an MPV or multi-purpose car (referred to as a minivan in the united states) generated by Toyota since 1990. The name "Previa" hails from the Spanish and Italian for "preview," as Toyota spotted 1st Previa as a vehicle that will preview technologies found in future minivans. Combined with Toyota Sienna, the Previa may be the 2nd largest minivan in Toyota's line-up after the bigger and much more luxurious Alphard/Vellfire (which is perhaps not available in most Western areas). The first generation, designed by Toyota fashion designer Tokuo Fukuichi and Calty fashion designer David Doyle in 1987 (patent submitted 24 December 1987), was launched on 27 January 1990, have one sliding side-door for the back individuals. They showcased an original mid-engined system, where in actuality the inline four-cylinder gasoline-powered system is set up virtually level (at a 75-degree direction), beneath the front side seats. Installing the motor within setup permitted averagely quick access towards spark plugs, which were located underneath a panel in the higher left-side for the car, after getting rid of leading passenger seat, the carpet, and an access panel. All engine-driven add-ons, including the alternator, power steering pump, air-conditioning compressor, and radiator fan, tend to be accessible through the front side hood, driven from the front for the engine by an accessory driveshaft, and is referred to as Supplemental Accessory Drive System, or "SADS." This allows even for front/rear pounds distribution, which benefits ride high quality and control. But furthermore prevents the installation of a larger motor, whilst expense cannot become relayed by sharing the working platform with other cars. 1st generation Previa was 4,750 mm (187.0 in) very long and 1,803 mm (71.0 in) broad. In Japan, two modest versions, the Toyota Estima Lucida and Toyota Estima Emina, were created, of more or less 110 mm (4.3 in) narrower and 70 mm (2.8 in) shorter compared to the standard design, which always been marketed in Japan but since the "wide-body" Estima. The reason behind the essential difference between the smaller Emina and Lucida versions is the car income tax program in Japan, which can be on the basis of the goods of length of this automobile, in addition to modest alternatives belong to a lower life expectancy tax band. The Estima Emina and Estima Lucida had been additionally offered with a 2.2-liter diesel motor (3C-T and 3C-TE). In Japan, the Estima and Estima Emina had been unique towards dealerships called Toyota shop. The Estima Lucida marketed at Toyota Corolla shop dealerships. The first generation Previa ended up being available in both rear- and all-wheel drive variations (called All-Trac) and running on a 135 hp (101 kW) JIS (99 kW) four-cylinder 2.4-liter gas injections engine. Readily available with a four-speed automated or five-speed guide gearbox, this Previa additionally seated seven or eight everyone, with three seating configurations offered (the united states only obtained the seven traveler configurations, nonetheless). All configurations have actually a motorist and forward traveler seat ahead, and a three-seat bench chair at the back that splits and folds level against the edges for the cabin. The eight-seat setup contains a 2/1 separate swiveling bench seat at the center row, although the seven-seat configurations consist of either two on their own swiveling captain's chairs (known as "Quad Seating"), at the center row or a two-seat workbench counterbalance towards the driver's part. The third line normally much better upholstered within the seven-seat variation. It absolutely was readily available with either four-wheel disc brake system or conventional front disc/rear drum braking system setup, with anti-lock brake system (abdominal muscles) as a choice. In the usa, the Previa ended up being marketed from March 1990 (for the 1991 design seasons) to 1997. It was brought in from Japan to contend with Chrysler firm's effective Dodge Caravan minivan, and its twins Chrysler town-and-country and Plymouth Voyager; Chrysler CEO Lee Iacocca accused Toyota of dumping the Previa in the us to take share of the market when you look at the minivan portion from Chrysler. However, his statements were never ever substantiated. While the Previa proved much more popular versus Toyota Van it replaced, it did not get considerable share of the market from Chrysler---due to its greater price, questionable styling (because of its time), lower gasoline economy and engine performance---and also because Chrysler launching redesigned minivans around the same time. The mid-engine design shown to own a substantial limitation---the incapacity to include larger engine sizes, which shown a problem as United states drivers were used to having more energy; the Dodge/Plymouth/Chrysler designs had been sold with readily available V6 engines with somewhat additional power. At same time, this layout issued the Previa greater internal area compared to the Chrysler rivals. Starting with the 1994 model 12 months, Toyota experimented with rectify motor results by installing a Roots-type supercharger with air-to-air intercooler, offering six psi of increase (these brands had been known as the "S/C"), taking the engine power up to an aggressive 158 hp (118 kW) and increasing gas mileage from 17 to 23 mpgUS (14 to 10 L/100 kilometer). At first, the S/C system was only available as an option from the LE the 1994 design seasons and all designs for 1995. America type of the Previa is discontinued after the 1997 model seasons, replaced because of the more typically created, front-wheel-drive, US-designed and built, Camry-based Sienna. The insurance coverage Institute for Highway Safety has given the Toyota Previa a "bad" score. 1st generation Previa was advertised inside Netherlands between 1991 and 1994. In 1994 the supercharged or SC model had been made standard on all Previas. 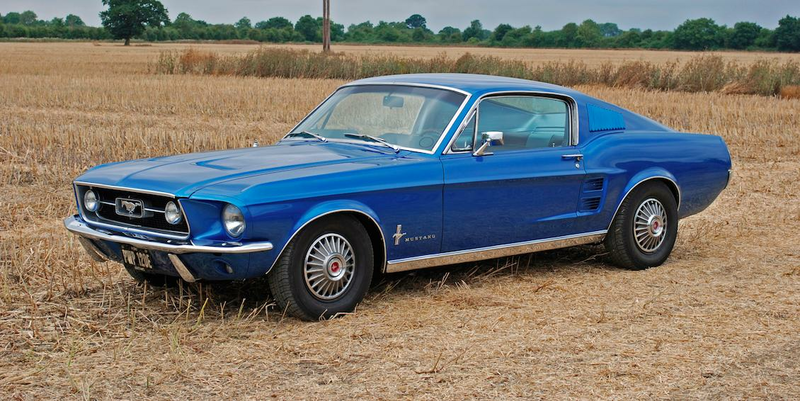 The actual only real engine ready was a 2.4-liter 4-cylinder engine until 1995. Trim amounts are base (later on renamed to i denoting an injection motor), GL, GLi and GXi. The 2.2-liter diesel version is a well known grey import. In Australia, the Tarago was offered in GL/GLI, GLS, and GLX kinds with 7--8 traveler sitting from 1991 systems. Aside from the Australian markets, there have been various special version brands readily available, which varied in trim values. These include the RV (either 5-speed guide or 4-speed automated with 4WD), commemorative Rugby World glass editions and Getaway. Feature-wise, the special version models were advertised amongst the base GLI and GLX designs. Once the later-style upgrade brands were released in Australia, the top of the line GLS model was renamed "Ultima" additionally the Getaway became a mainstay trim level, becoming rebranded Getaway II. The five-speed manual Previas (us versions) are made from 1990 through to 1993 (model seasons 1991 to 1993); nothing among these has a supercharger. Beginning in 1991 for model 12 months 1992, Previas (united states versions) included a driver's side environment bag and third brake-light with dual airbags getting standard in September 1993 for year model 1994, becoming earliest minivan to supply a passenger airbag as standard. From 1991 to 1997 (from 1992 to 1997 design years), us Previas also included a swivel feature in the recommended middle-row captain's seats; 1990 to 1991 production (1991 model season) have fixed optional captain's seats. On Previas outside the U.S., ended up being an ice-maker/refrigerator that doubled as a drink heater labeled as the Hot/Cool package. The supercharged engine is different from generally aspirated motor, because of hook decline in compression ratio and more powerful engine internals. The supercharger try engaged on-demand by an electromagnetic clutch, predicated on feedback from the system management system computer system (the Engine controls product, or ECU). Previas posses recommended dual moonroofs: an electrical horizontal-sliding only cup moonroof over the middle line of people, and a pop-up glass moonroof above the front side seating. Previas are also 1st van to pass all US protection standards as regarding front effect, driver air bag, traveler air bag, center-mounted braking system light, ABS, daylights, etc. Fuel useage try below average (11-13L/100 km or 18.1--21.4mpg city, 10-11L/100 km or 21.4--23.5mpg highway); the small 4-cyl motor needs to run a little harder owing to the energy to load ratio of vehicle, compared with nowadays's 6-cyl motors. The inclusion associated with the supercharger somewhat improves energy and gives better fuel usage. The Previa provides an almost omniscient view, excluding the pillars behind the front doorways. This transforms the van into a greenhouse, accumulating severe temperatures in a brief period of time, although solar power control glass later became a choice, to help alleviate the difficulties. Previas are affectionately called "eggvans", "eggs", or "beans", because of their form. In Australia, they have been named "Wombats", since they somewhat resemble the marsupial of the same title. The leading passenger seat and a section of flooring pan must be eliminated to do a tune-up while there is not enough space to remove spark-plug prospects or ignite plugs. Whenever insurance coverage Institute for Highway security tested the 1996 design in offset front crash test, they revealed many safety trouble: the cabin construction is volatile, the steering wheel moved up right towards the windshield, the lap gear tore which allowed the dummy to finish up in a partly reclining place, and there were highest forces on each of the lower feet, in which the IIHS assessed it "Poor". In certain nations (primarily Australia, Japan while the great britain) unsold Estimas and Lucidas are re-badged as 1995/1996 Previas. Find a new or used TOYOTA TARAGO for sale. With over 100,000 new & used vehicles on CarsGuide, finding a great deal on your next TOYOTA TARAGO has never been so easy. Compare Toyota Tarago complaints, problems, & worst model years. There are 2 complaints on file for the Toyota Tarago. View the entire range and specifications for the Toyota Tarago. Contact a dealer now. Find great deals on eBay for toyota tarago and toyota tarago car. Shop with confidence. Check out news and reviews on 2006 Toyota Tarago - See exclusive insights, specs, photos, prices and more on Top Speed.